Perform flawless finishes with the ETS 125 REQ PLUS Random Orbit Finish Sander. 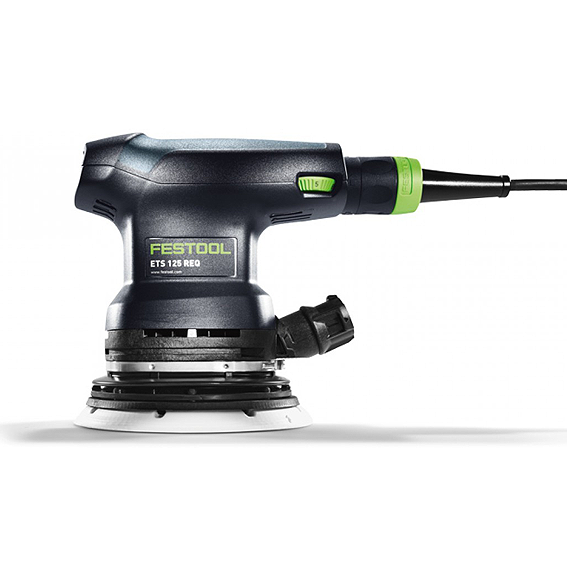 The versatile ETS 125 has Festool's finest sanding stroke at 5/64" (2.0 mm), and is the ideal one-handed machine for maximum surface quality when finishing or pre-sanding. Compact in size and weighing only 2.6 lbs., the ETS 125 is perfect for extended sanding use on vertical surfaces and overhead work, and is ergonomically formed to fit comfortably in any size hand. Technical features, such as the Sanding Pad Brake and balanced Vibration-Stop (VS) design, deliver better finish results, smooth operation, and greater comfort, and put the ETS 125 in a category of its own. Step-less variable speed allows you to adjust to the needs of the application. Includes: ETS 125 REQ-PLUS; StickFix Soft Sander Backing Pad for ETS 125 Sander, D125 Edge Protector; Longlife Dust Bag; and a SYS 2 T-LOC SYSTAINER.